Moving between levels of a building was never considered fun. It was always taken as a part of routine. But a new installation in Austria’s OK Center for Contemporary Art has made this routine task a fun one. 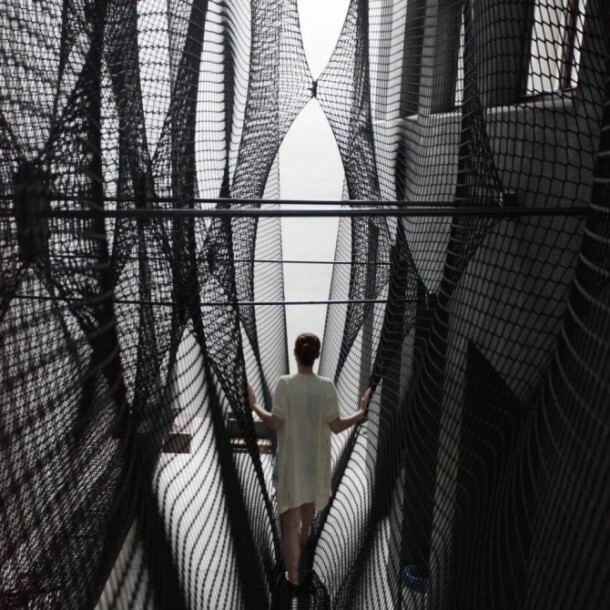 Net Linz is designed by design collective Numen, who are famous for their String installation earlier this year. The string is installed in the form of a 3D grid of ropes that are suspended within a huge, blank, inflated cube. Individuals can climb around the cube in an unusual and disorienting environment. 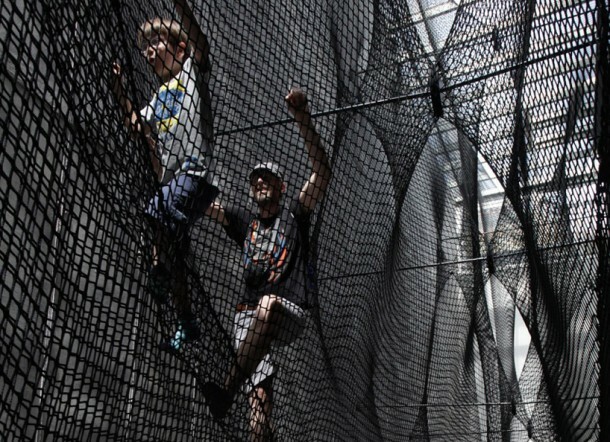 Net Linz is a rope structure that is similarly interactive. 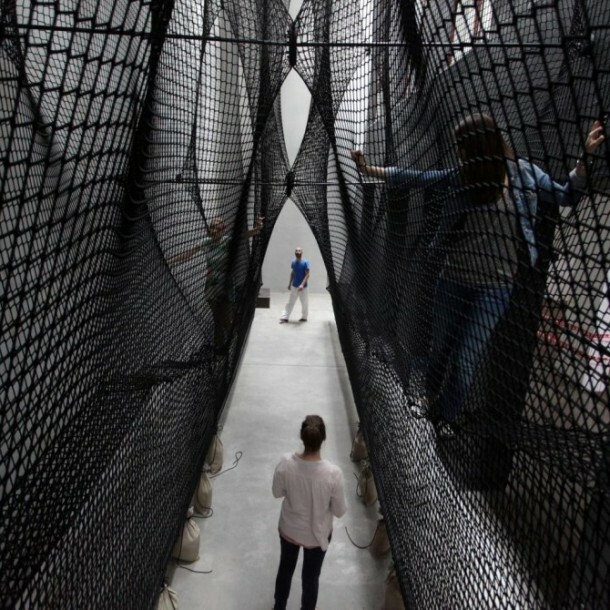 According to Numen, Net Linz is an “inhabitable/climbable social sculpture serving as an experimental staircase in the exhibition space.” The dimensions of Net Linz are 25 m long, 10 m high and 4 m wide, and can be accessed from any level of the building. 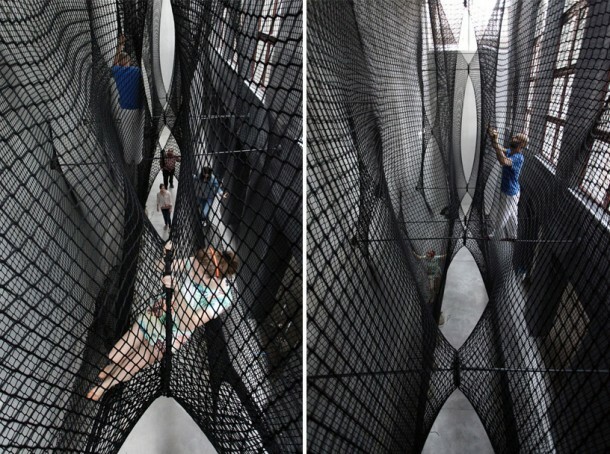 According to Nikola Radeljkovic of Numen, it was designed for the OK Center space specifically, though based on previous Net installations created elsewhere. The nets have that canyon-like look to them, as a result of being hung between the ceiling and the sand bags to weigh them down to the floor. Climbing them can provide a winning and rocky sensation. Some visitors have spent hours climbing up and down the nets, Radeljkovic reports, regardless of the hard and uncomfortable rope material. Net Linz is on display at the OK Center for Contemporary Art in Linz in Austria, until October 19th.